As everyone says, Breakfast is the most important meal of the day….. being a working woman.. I usually dont have enough time to make something special in the morning every day. So mostly we have either Idly or Dosa every alternate week. For these I can prepare the batter on sunday, so that it lasts for me for the whole week. The other problem that arises is the chutney…. 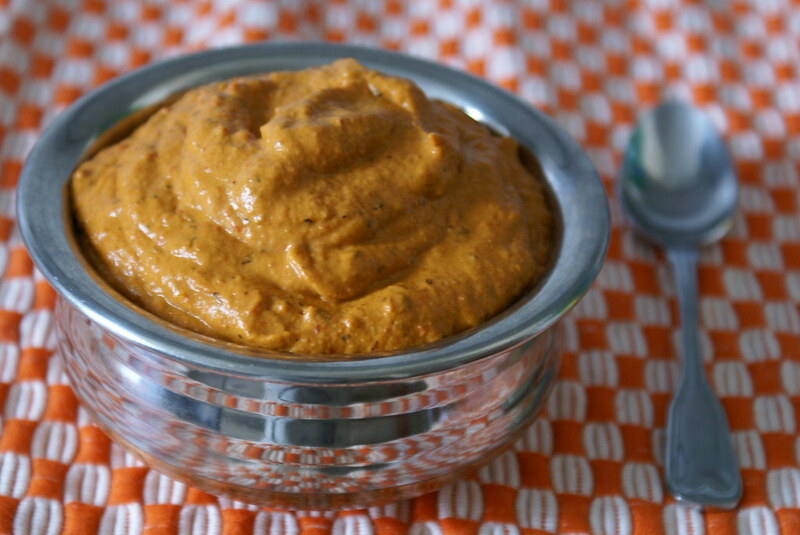 eating peanut or coconut chutney everyday is not that very healthy option. So when I was searching for alternatives on my favourite blogs, I came across this bell pepper chutney in Indira’s Mahanandi blog. It is very healthy, tasty and easy to prepare…. Heat oil in a kadai and add red chillies, bell peppers, garlic and onion and roast till done. Dry roast peanuts in a seperate pan. (I used already roasted tinned peanuts). 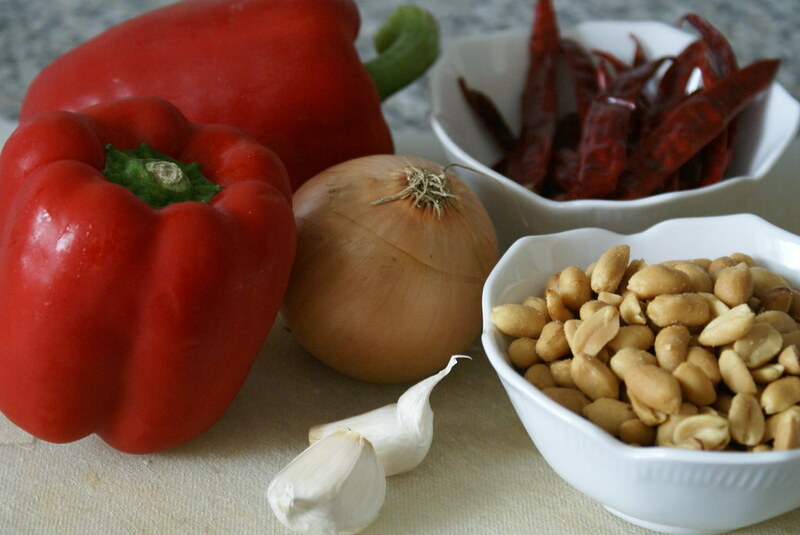 Once the roasted veggies cool, grind all the ingredients to a coarse paste without adding any water. 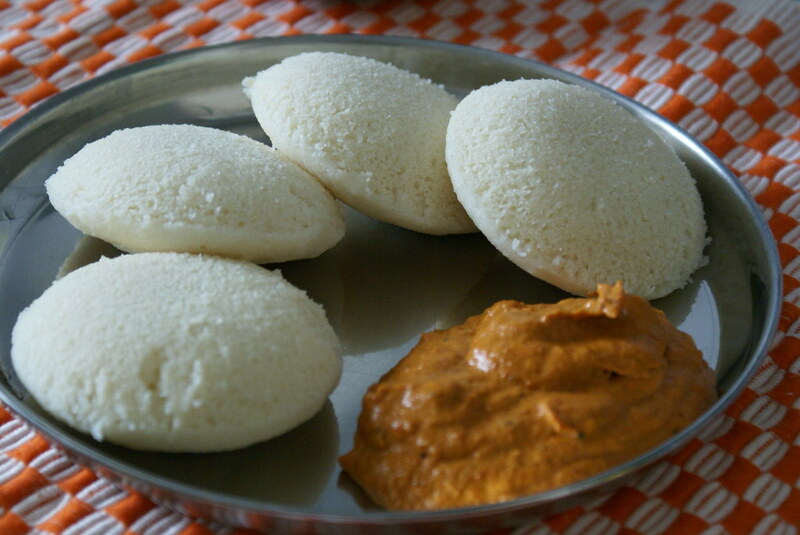 Serve with any breakfast like, idly or dosa.. even tastes good with hot rice. J liked it very much, it was different from the regular chutneys we have. It has a mild sweet taste from the red peppers and was very yummy. I served it with Idlies and it was a huge hit. Mona from Zaiqa forwarded me this “Brilliant WebBlog Prize“. When you recieve the prize you must write a post showing it, together with the name of who has given it to you, and link them back. Choose a minimum of 7 blogs (or even more) that you find brilliant in their content or design. Show their names and links and leave them a comment informing they were prized with ‘Brilliant Weblog’. Show a picture of those who awarded you and those you give the prize (optional). As the custom, I furthur pass this award to Amulya of Amu’sWorld, Keerthi of CuminHut, Padma of Padma’s Kitchen, Cynthia of Tastes Like Home, Cham of Spice Club, SriValli of Cooking For All Seasons and Pallavi of All Things Yummy. Amulya of Amu’s World passed on this “Yummy Blog Award“. Thank You dear for this…. I would like to Thank both Amulya and Mona… for these awards… Thank You Girls!!! I love this chutney! THE PICTURE OF THE CHUTNEY LOOKS GREAT. Chutney is amazing… COngratulations for your Awards!!!!! Chutney looks amazing and will go well with those fluffy idlies. Thanks for the award! Hi, ur chutney pix is very nice. Congrates on ur awards…!!! I loed this one at Mahanandi, love it here. Cinnamon..even I first tried Bell pepper chutney from indira’s blog. Try this chutney without peanuts..just saute onions,tomato,tamarind and red bell pepper and grind them into a paste..it is to yummy!! Cinnamon, thanks for the award, thats so sweet really..
Chutney looks delicious and great…Congrates on ur awards…!!! Wow, looks so inviting. I have had it in one of my friend’s house. But forgot to get the recipe. Thanks that you have posted it here. That chutney looks so delicious. Congratulations on the awards and your chutney looks like it turned out perfect! Congratulations and thanks a ton for passing the award Spanz…Howzz everything at ur end? Will try to upload more recipes with Capsicum.